September 7, 2015 January 2, 2017 / Elizabeth T.
Is it just me, or is that a breeze I feel? Yes, it is! 😀 Seems like we’re finally getting our first taste of fall! Whether paired with jeans or shorts or even a skirt, t-shirts can be used as a basic piece to play up the style that you want to emulate. If you want to go for a girly-meets-tomboy look, then tucking a fun t-shirt into an a-line skirt can play up that trend. With shorts (and maybe even tights underneath since we’re going to be moving into fall), a funner and more trendy outfit can be created. I hope you all liked these photos 🙂 It was definitely a super fun shoot, and I hope you’ll all like the photos as much as we liked shooting them! 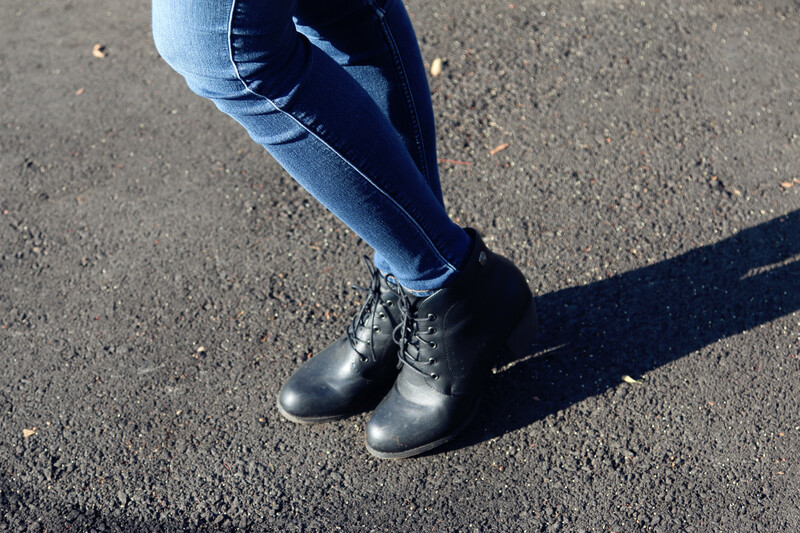 What’re you all wearing as we finally transition from summer to fall? Let me know in the comments! 🙂 Thank you all! And hope everyone had a wonderful Labor Day weekend! Yup, I really like all your photos. I just love everything from your outfit and to your choice of background. So cool and perfect.Thanks for sharing. beautiful photos, love that top! I do love these photos, looks like you had a great time doing this shoot. You look great. Very appropriate location, love it! I can’t wait til Fall, it’s my favorite season and I’m a gal who loves her sweaters. Hope you’re having a great week Elizabeth! Loved every single bit of this outfit,okay fine that shirt is my fave (an old lady talking haha). Haha noo, I’m a big fan of the shirt as well 🙂 Simple styles with a quirky design are so easy to wear! And I know ❤ I can't wait for sweater and boots weather too! Thank you so much for stopping by, Tiffany! Dopes shirt and style. Thanks for sharing and happy Wednesday. Love your outfit ! Looking great ! Very fun and cute look! I love those tops and I’m also a huge fan of the “tuck your shirt in your jeans” look! Thank you dear ❤ You're too sweet! Love this outfit! Beautiful photos! i wish i could look good in jeans like you do! I love a simple t-shirt with jean look as well. It is such a basic look but so chic. 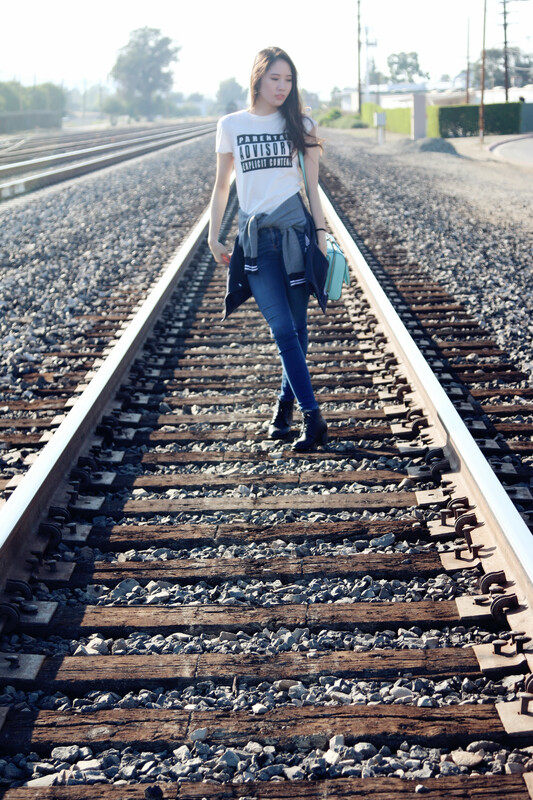 I love your shirt and your photos are great, I’m glad the railroad was deserted. Your bag was such a nice addition to this outfit. I love the color of it. Aww thank you so much Kathy 🙂 I really appreciate your kind words! I like these photos very much! You really work hard to make this post special by choosing a new location. The simple but chic outfit is perfect! Have a nice weekend! Aww thank you Danielle 🙂 I’m really glad that you liked these photos! Hopefully, I can bring even greater photos to you guys in the future as well! You have the body of a model 😀 So pretty!!! Aww you’re too sweet love 🙂 ❤ Thank you so much for stopping by! awesome photos, the location is perfect. totally loving your casual yet cool look! What an eye-catching logo tee. Really like that casual vibe when you wear it with the super cute varsity jacket! Thank you Shirlyn! 🙂 ❤ The varsity jacket is one of my favorite fall pieces to wear! love this tomboy look! very casual chic! What a cheeky little photoshoot. Love your jeans your legs are freaking beautiful. Aww thank you so much Karen 🙂 You’re too sweet! What a fun post! Hope you enjoyed. You look fab…and totally into the tee and jeans!